Genie Lifts is safer, more efficient alternative to ladders. Genie lifts drivable when fully elevated. 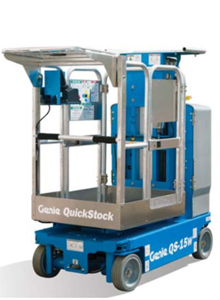 Genie quick stock is small working envelope for maneuvering around corners. Genie lifts are standard 6 ft. extension cord for easy charging – no additional tools needed. Up-front mounted joystick for excellent viewing when driving. 12 and 15 ft. models come standard with a rear workstation tray.